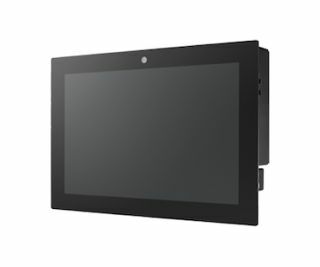 The What: Advantech recently released its UTC-510D, a multi-purpose 10.1-inch interactive touch computer. The computer is powered by an Intel Atom E3825 and Celeron J1900 processor with 8GB of DDR3L memory. The UTC-510D supports multiple operating systems, including Android, Windows, and Linux. The What Else: As with previous Advantech UTC products, the UTC-510D is designed with a fanless system in order to ensure quiet operation and reduce the accumulation of dust and foreign contaminants. The chassis is scratch resistant and has an IP65 certified front panel screen. The 16:10 LCD widescreen with multi-touch functionalities has a unique panel mount frame that supports recessed wall mounting for better space optimization and convenience. The frame color can be produced in any color upon request. The UTC-510D can also be ordered with a magnetic strip reader, RFID reader, iBeacon module, or barcode scanner in addition to its already built-in 5 megapixel camera and Wi-Fi connectivity. The Bottom Line: The UTC-510D is currently available for purchase, starting at $660.